As I type this, Vicki is writing a note for the house sitter, and when I shut down the computer, I will load our suitcases and shoes in the trailer, and away we will go. Schedule? Drop by and pick up one team member on the way to church. Meet the other team members at church. Tune up and lead worship. Have the brothers and sisters lay hands on us and send us. Remember us in your prayers. We will be back on the 2nd of August. God bless everyone who gave, and everyone who prayed and will pray! And Sunday about 11:00 AM we will be saying GO! Sunday morning will find us in church, having the saints pray over us and launch us on the trip to buy shoes. We will stop briefly for a hamburger and hit the road to arrive sometime around 9:00 PM in Katy Tx. Mid afternoon on Monday will find us in Mexico. Please pray for all on the team, the vehicle and trailer, and the children we will minister to. We will be returning on August 2nd. Vicki was out shopping yesterday for school supplies for the Piedras Negras kids, and found spiral bound notebooks with 75 pages for five ( 5 ) cents apiece! Yes, you read that right. 5 cents apiece! Psa 37:23 The steps of a good man are ordered by the LORD: and he delighteth in his way. Looks like He was guiding Vicki right into that Good Deal. countdowns are always exciting. I remember as a young lad hearing my 1st countdown as Alan Shepard was strapped into the cockpit of Freedom 7, the first manned flight in the Mercury program. It was amazing to think that a man was actually going into outer space. Sitting in the Mrs. Hester’s 4th grade classroom, we strained to see on the Admiral black and white TV. I believe it may have been a whopping 17″ screen on that set! Now, years later, countdowns still get me going. We are in one right now as we prepare for our 5th trip to Mexico. Today marks 13 days until we pile in the LTCM minivan and “deliver the goods” to the orphans of Piedras Negras, Mexico. So, count down with us. Mark it on your calendar and mark off the days. Pray for us, and each day as God to prepare everything – Our path, our vehicle, the children, the workers, and most of all – our lives as the team, so that we can be a blessing to everyone we come in contact with! 13, 12, 11, 10…………………………………..Count with us!!!! Another step in the process of taking the LTCM summer SHOE team to Mexico is done. Hotel reservations have been made for the trip both ways, there and back. The trailer hitch is on the minivan, the minivan is wired for the trailer. Vicki begins loading the totes now to pack into the trailer. School supplies, toiletries, and all manner of other things will be loaded. Team members are beginnning to get excited and think about what to pack, etc. The itenerary has been set. The daily devotion assignments are set. The lesson on the Ten Commandments will be tweaked. Duties will be assigned to team members. The to-do list is being “whittled down”. Change the oil and rotate the tires on the minivan. Get a spare tire and jack for the trailer. Life is busy at LTCM headquarters ( our house ). But isnt that the way it’s supposed to be? Busy for the Kingdom. Bless all who have given. Bless all who will give. Did you know that YOU are ministering to children right now in Crimea, Ukraine? You sure are! 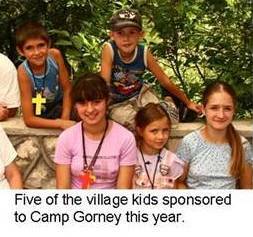 Through your giving, two children from the Chernobyl area are in a Bible Camp right now! Bridges of Faith team members are in Camp Gorney for two weeks, having a Bible Camp for orphans. But as we all know, it is not only orphans that have serious needs. The Chernobyl area has very few fathers. Most of the middle aged men from that area of Ukraine were either killed from radiation posioning from working on the nuclear reactor catastrophe, or are elsewhere trying to work. All of the small outlying villages are in terrible disarray. It is like going back in time, without running water and neccesities. LTCM sponsored two children to go to the Bible camp this year. Here in the picture are 5 of the kids sponsored by various people or ministries. Normally in the villages that these children come from there is not much to smile about. But here you see the effect that Camp is having on them. They will return to their village knowing that there is a God who loves and cares for them. Their lives will be affected forever! 3 years ago today LTCM was born. I remember the bench I was sitting on in Camp Gorney, Crimea, Ukraine. Vicki and I were there for the second year, and we both knew that we were to continue in missions work until God tells us otherwise. Sitting there that day, after a wonderful Bible class with the orphans, I remember hearing that “still, small voice” in my spirit. He said “If you will start the ministry, I will supply you with what is needed”. 3 years later, we still stand in awe of everything that God has done! Celebrate with us today! Thank all of you who pray, give, and believe with us!